Durability is a common problem with lesser cranks. Crank bills shearing off, body-halves cracking, paint wearing rapidly and eyes coming out after a few minutes of cranking are all noted issues. M65 is known to combat these issues successfully. Quality and durability are the basic DUO standards. Impeccable design characteristic are not just there for looks. Multiple internal beams and chambers provide structural integrity beyond standard cranks. The M65’s action is unprecedented. It possesses excellent tight vibration and water displacement is significant. The low co-efficiency allows for the lure to move through the water and air balanced and without heavy line tension. 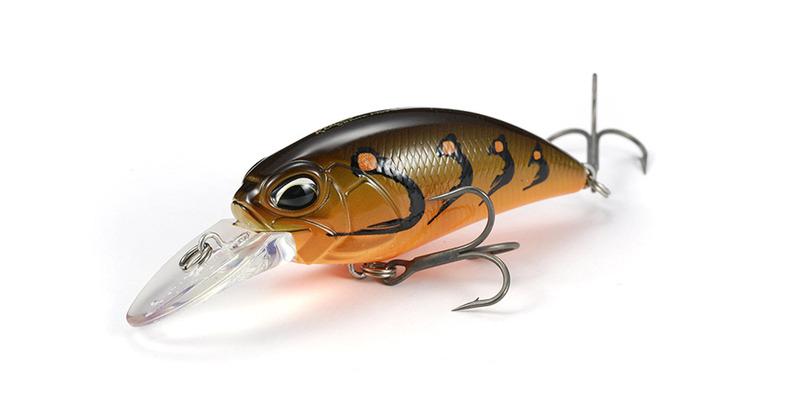 In addition the lure has a sharp dive angle that helps it reach its stated depths. The M65 8a will dive to 9 feet and the M65 11A dives to 12 feet with little effort. Many crankbaits inherit a problem known as ‘jogging’ when colliding with cover. The impact hinders the bait’s swim motion, fouling the lures tracking and causing it to roll over axis, and then on its side with no return position. This is not erratic action, although often mistaken as such. However, with the M65, there is an elaborate ballast system that rests directly on the lowest part of the M65’s keel. When the M65 crashes into object, the force changes its trajectory along the object. However, it immediately returns to it balanced position and remains on tracking true. The M65’s performance doesn’t end with movement. It has a very sophisticated sound chamber. While other cranks use beads or bee-bees to articulate its lure sound, the M65 11a uses a sound baffle. The perforated metallic baffles are situated vertically in a chamber that allows a bearing to contact each baffle, capturing and re- distributing a unique sound. It carries a dual pitch not duplicated. Both M65 crankbaits were loaded with performance but it is the complete package offered in this series that is going to give the angler an advantage. You may be able to ascertain why the M65 was a five year project. There is no crankbait like it. We have employed a fixed weight system to enhance the highly responsive cranking action. The weight distribution and aerodynamics of the body design has been carefully considered to give it the top of the class casting distance. We have loaded the lure with 3 conflicting factors, “strong water-pushing wobbling action”, “light reeling sensation” and “range keeping ability”. It has also been given sufficient buoyancy to produce the “sharpness” in its action, while responding to both slow to fast retrieval. The hook size was one of the factors where Mr. Murata placed great emphasis . As we all know, he has traveled to the most exotic water systems and oceans to conquer various species. In order to successfully land monstrous bass and other exotic species, a one size bigger and thicker hook size was essential.